The Hitching Post II is a favorite to locals and visitors since 1986, and home to world class Hitching Post Pinot Noirs. 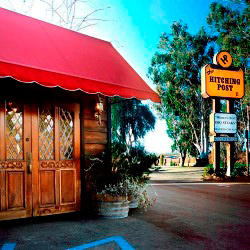 The Hitching Post II serves wood fire grilled fare in the “Santa Maria Style” barbeque tradition, an indigenous cooking style of the original native Chumash, and assimilated into the Spanish Rancheros that settled early California. The Hitching Post II offers high quality food and wine presented in a casual and relaxed setting. Known for great steaks, seafood, artichokes, their own house made highly regarded Hitching Post Pinot Noirs, and the centerpiece of Sideways. “A must stop for beef & Pinot lovers” (New York Times), and “well worth a trip from anywhere” (Gourmet Magazine), the Hitching Post II is the quintessential Santa Barbara Wine Country experience.